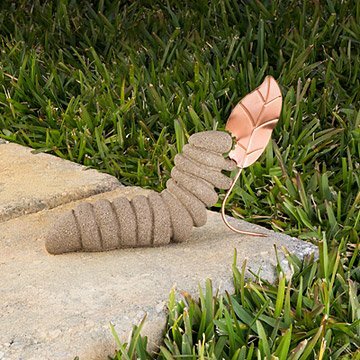 Invite this sweet little critter into your herb garden or flower patch, made from cast stone and copper. Clifford the Copper Eating CaterpillarTM makes a sweet addition to your herb garden or flower patch. Made by Lisa Fida from cast stone, this outdoor sculpture creates a charming tableau among the rosemary or rose bushes. The hand-forged copper details develop a natural patina over time, lending an organic look to your newest garden dweller. Handmade in Lowell, Maine. For more copper critters, check out Suzzie the Sunday Strolling SnailTM and Freddie the Fly Catching FrogTM. Clifford is an adorable hit! I loved this item, he was just right for her ZEN garden! So unique. Craftmanship is above and beyond. This will send more shoppers to you. The item is over-the-top beautiful! The past, present, future earrings are very small and not as colorful/contrasting as image depicted. Needs a visual comparison for size. The cement catepillar is very cute but small. Also needs a visual size comparison (in addition to the dimensions that were provided). No time to return, but probably wouldn't buy again. Love Clifford but . . . I haven't given this to her yet but am sure it'll sit on a shelf above her catapiller containers in her enclosed porch . . . we love our milkweed eaters !!! It's a gift for a friend and I'm sure she's going to like it. Clifford graces my mantle, and makes me smile every time I catch sight of him. He's a reminder of all the cats I helped become butterflies, how much there is to learn and understand about the workings of our world, and how blessed I am, in friendship, in family, and faith. Clifford now lives on my front porch. Saving one for myself. Two are Christmas gifts for family members.